Description: Developers from Infinity Ward divided Call of Duty 2 into three campaigns (Russian, British and American) and put into the game a lot of new features (e.g. no health indicator, option to complete mission objectives in different order). Expanded multiplayer modes are also available. 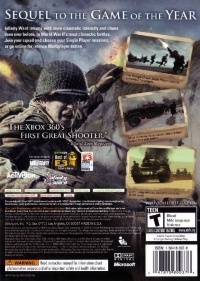 Box Text: Once again you can experience the WWII battlefield, in Call of Duty 2. This sequel adds a new game engine, which provides improved visuals, AI, and weather effects. You can employ real squad tactics as you make your way through four distinct campaigns, each following a single soldier as he battles through historic conflicts. 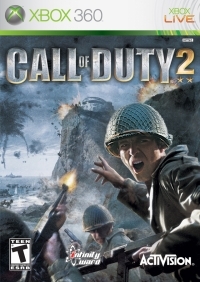 Call of Duty 2 also features maps that feature multiple paths to follow, offering a variety of cover and opportunities to use team tactics. Multiplayer modes return as well, allowing you to test your skills online against other players. 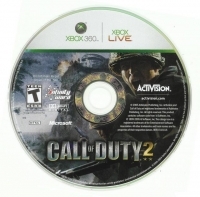 This is a list of VGCollect users who have Call of Duty 2 in their Collection. This is a list of VGCollect users who have Call of Duty 2 in their Sell List. This is a list of VGCollect users who have Call of Duty 2 in their Wish List.